In addition to how feet can be positioned relative to the ball or to each other, the feet can also vary in how they are positioned relative to the target line. 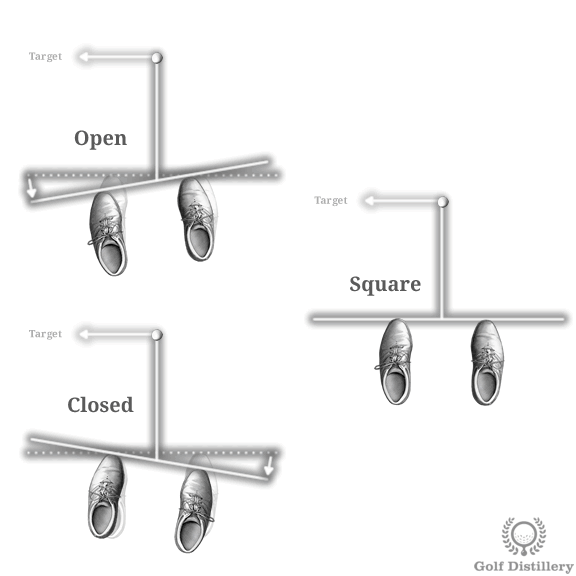 The positioning of the feet in relation to the target line is called the stance and there are three main positions, which are explained below. 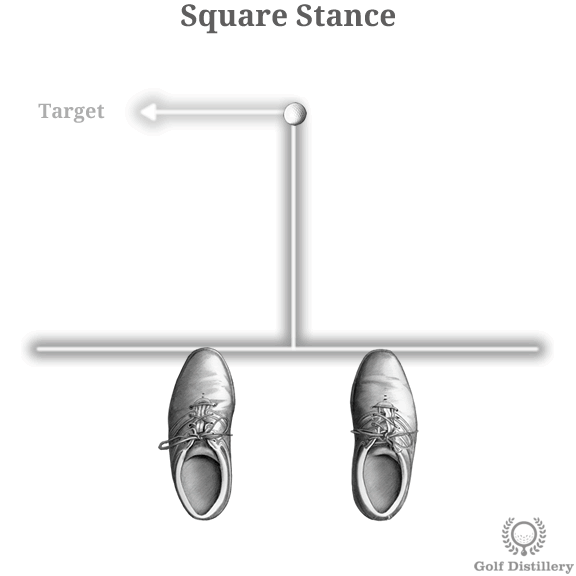 In order to adopt a square stance you simply place both feet in a way that the toe line (and even better the heel line) is parallel to the target line. It is indeed better to use the heel line when setting up because that line is undisturbed by foot flaring – if any – which will change the toe line without impacting the stance. A square stance leaves the loft of the club unaltered. 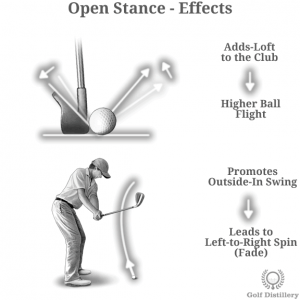 This means the ball should travel on a flight path that is in line with what the club was designed for. By being parallel to the target line a square stance promotes an inside-square-inside swing path, which ultimately leads to a straight ball with little sidespin to speak of. 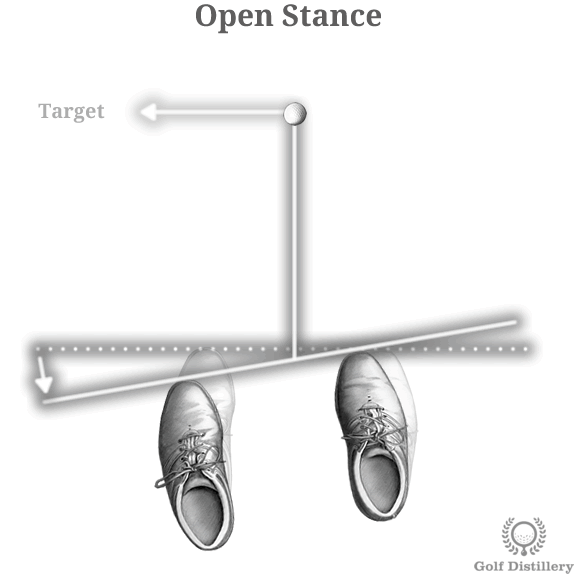 An open stance is one where the toe line – or again the heel line – is not parallel to the target line but will instead cross it behind the ball. In other words, the toe line of an open stance will be aimed at the left of the target. In order to position yourself properly for an open stance you are best to adopt a square stance first. After adopting a neutral stance you can then move on to making the adjustments which simply involves lifting your left foot from the ground and withdrawing it slightly back. Then it’s simply a matter of rotating your right foot slightly so that it rests comfortably on the ground and is parallel to the left foot. 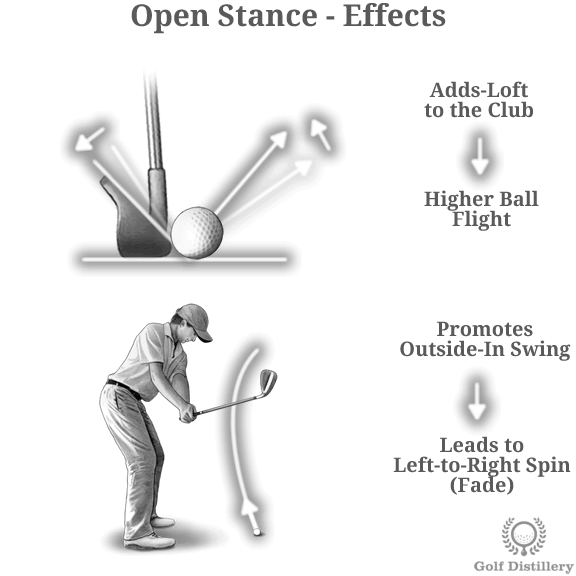 The first immediate effect of adopting an open stance is that it opens up the clubface relative to the swing line, which will increase the loft of the club. Ultimately this will lead to shots that are higher in altitude than what is normally associated with a given club. Indeed, while the clubface is still square – or perpendicular – to the target it will be open in relation to the swing path. And regarding the swing path, an open stance will promote an outside-in swing path which will lead to a ball with left-to-right sidespin, a spin associated with fades or slices. 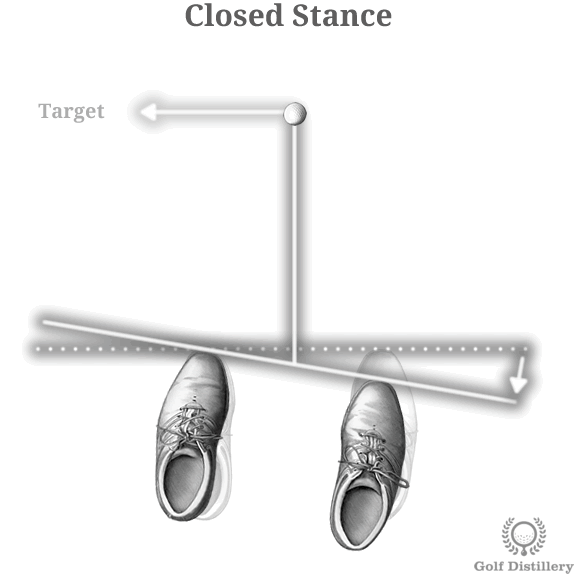 A closed stance is one where the toe line is not parallel to the target line but is rather crossing it in front of the ball. Or more simply, the toe line of a closed stance will be aimed at the right of the target. 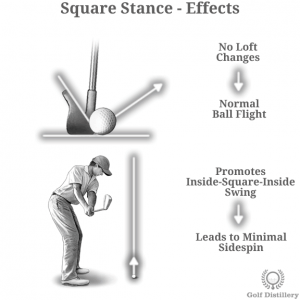 You first position your feet for a closed stance by setting up in a normal, square stance. Then it is simply a matter of lifting your left foot from the ground and advancing it forward while rotating around your right foot. Finally, you move your right foot slightly in order for it to rest comfortably on the ground and parallel to your left foot. 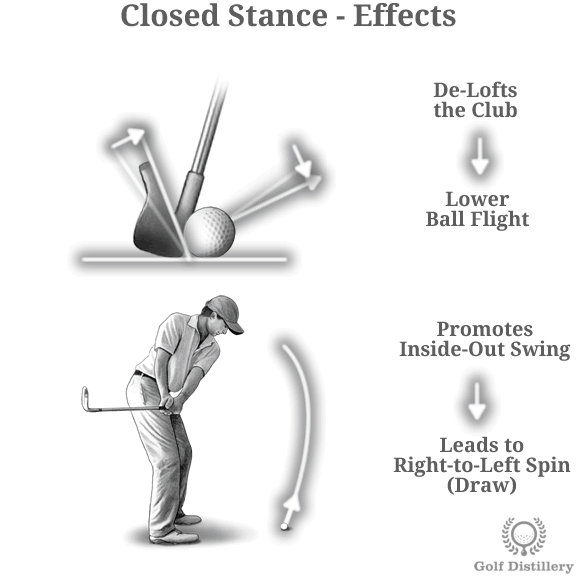 The immediate effect of closing your stance is that it closes the clubhead relative to the swing line, which decreases the loft of the club. Ultimately, this leads to balls that fly lower than what the club was designed for. Indeed, while the club is still square to the target line, it is closed relative to the swing line. The change in swing path will promote an inside-out swing that will be conducive to right-to-left sidespin, a type of spin associated with draws and hooks.